Established in 1984, Shoptech Software is a leading provider of shop management software for job shops and make-to-order manufacturers. Shoptech founders Rich and Greg Ehemann actually grew up in a shop. While working there, they realized that a vital component of a make-to-order manufacturer’s success is the ability to determine whether they are earning or losing money on a job-by-job basis. So Wells tasked one of his managers with finding the best vendor that could host Shoptech’s training curriculum and provide the specialized service that he was seeking for his team of instructors. In addition, Wells’s team had two product lines to teach. Consequently, he wanted Shoptech trainers to be able to train as many students as possible and have the online training platform manage all of his classroom instances on demand. And due to ReadyTech’s ability to quickly clean up and reset classroom instances, Shoptech can deliver two sessions per access code, doubling Shoptech’s revenue. Switching from in-person classrooms to virtual training can be a daunting task. And for Shoptech, they knew they had to switch to virtual training but did not want to worry about technology. After evaluating several vendors, Shoptech selected ReadyTech for their full-service approach. 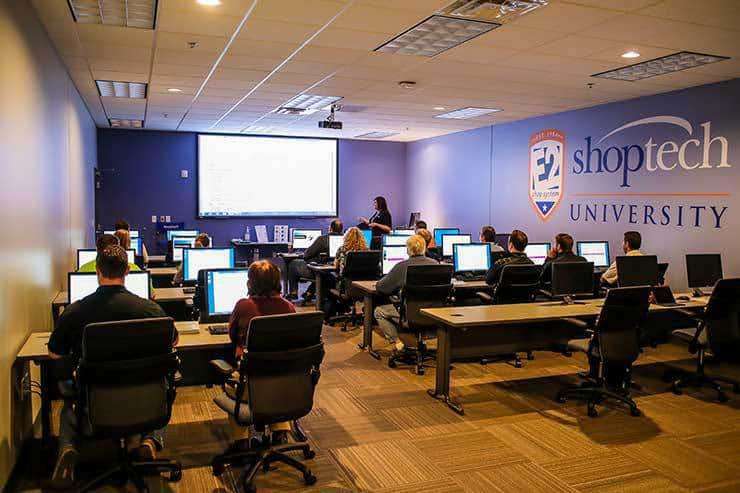 ReadyTech helped Shoptech through the entire migration to virtual training, which “removed a great deal of work and investment” on Shoptech’s part. It also meant that Shoptech’s instructors could continue focusing on their most important task: providing training to their customers.